Cotton Is Looking Fluffy Despite WASDE – A Seasonal Rally Could Be On The Horizon – Thrakika Ekkokistiria S.A.
Five consecutive weeks of gains in the cotton futures market. The monthly chart is looking good. Floods could cause supply issues, and a trade deal with China could cause demand to rise. Last year cotton exploded in May. The WASDE pushes cotton lower which could be an opportunity – BAL for those who do not trade futures. Cotton can be one of the wildest commodities that trade on the futures exchanges. Before 2010, the price of the fiber never traded above $1.1720 per pound, but in 2011, the price rose to over twice that price when it rose to a record peak at $2.27. The rally in the cotton futures market was fast and furious, and the dip that followed was equally volatile. Cotton traded to under $1 per pound in 2011 and has not traded above the one buck level since that wild and crazy year. The price of cotton hit rock bottom in 2016 when the price reached a low at 55.66 cents, and inventories rose to a level where there was enough cotton to produce two pairs of jeans for every man, woman, and child on the planet. Since then, inventories have moved lower, the economy improved, and cotton futures made a series of higher lows and higher highs. Last May cotton reached a high at 96.50 cents per pound before selling hit the market. The economic slowdown in China caused by trade issues with the US caused the price of the fiber to decline to a low at 69.53 cents in mid-February 2019, but since then the price had been rising and is now flirting with the 80 cents per pound level. The most direct route for a trade or investment in the price of cotton is via the futures and futures options that trade on the Intercontinental Exchange. However, the iPath Series B Bloomberg Cotton Subindex Total Return ETN product (BAL) seeks to replicate the price action in the volatile cotton futures market. The price of cotton has been rising over the past weeks and reached just below 80 cents per pound on April 9. The daily chart shows that cotton futures on the Intercontinental Exchange settled were at the 77.52 cents per pound level on April 11 after trading to a high at 79.31 cents on April 9 before the April report from the USDA. Price momentum and relative strength had risen into overbought territory on the daily chart, and open interest had declined from 231,728 contracts on April 5 to 219,456 on April 10 as some market participants closed positions going into and after the April WASDE report on April 9. The weekly chart illustrates that cotton posted gains for five straight weeks, and to keep that pattern intact for a sixth, it will need to settle above 78.34 cents on Friday, April 12, which is a little less than one cent above the price on April 11. The monthly pictorial for cotton is bullish, but the fiber has reached a critical level that will determine if it is on a path to challenge the 2018 high at 96.50 in 2019. On the longer-term chart, the price of cotton fell to a low at 69.53 cents in February before it climbed to just below 80 cents in April. While the relative strength index displays a neutral condition, price momentum is attempting to cross to the upside in oversold territory for the first time since December 2017. The metric fell after the 2018 high but has reached a level that could indicate technical support for the price of the fiber futures. At the same time, since the 2016 low at 55.66 cents per pound, open interest has been working its way higher and reached a record level in 2018 that was higher than when the price peaked in 2008 and 2011. The long-term picture for the cotton market remains supportive of price gains over the coming weeks and months. The 2018/19 U.S. cotton supply and demand forecasts show lower consumption and higher ending stocks relative to last month. At 3.1 million bales, U.S. cotton consumption is now forecast to reach its lowest level since the 1890s. Ending stocks are now forecast at 4.4 million bales, a 100,000-bale increase from both the previous 2018/19 estimate and from the current estimate for 2017/18. The season-average farm price is unchanged with a midpoint of 70 cents per pound. Lower world consumption this month results in higher projected 2018/19 ending stocks, with little net change in the other components of the global balance sheet. World mill use is forecast about 400,000 bales lower this month. A 300,000-bale decline in Turkey-and smaller declines in the United States and Vietnam-more than offset smaller increases elsewhere. Lower imports for India, Turkey, and Vietnam are largely offset by an upward revision for China. Lower exports for India and Burkina Faso are largely offset by Australia and Turkey. Higher production for China is largely offset by a decline for Burkina Faso. World ending stocks in 2018/19 are forecast about 360,000 bales higher this month, with an increase in China’s stocks more than offsetting a decline in stocks outside of China. The USDA tends to be optimistic when it comes to stocks and production, but floods in the US and the ongoing trade negotiations between the US and China are the critical factors that will determine the path of least resistance of the price of cotton over the coming weeks and months. We are at a time of the year where uncertainty tends to peak, so I am not reading too much into the price reaction to the April WASDE report. Cotton is coming into the time of the year where the most significant factor for the price will be the weather conditions across growing regions in the northern hemisphere. A late planting season because of high levels of moisture that lead to hot and dry conditions could dramatically change crop projections for 2019 over the coming months. Last year, uncertainty took the price to its highest level since 2014. As the monthly chart shows, the price of nearby ICE futures rose to a high at 96.50 in June 2018 after trading to a lower peak at 96.40 cents in May 2018. We are coming into a time of the year when cotton volatility tends to increase, and the price can move to a seasonal high. The chart also shows that cotton made a higher low in 2019 compared to 2017, so far. In 2017, the low was at 66.49 cents, and this year cotton only declined to 69.53 cents before turning higher and moving towards the 80 cents per pound level. In the middle of April, cotton is currently trading at around the 77.50 cents per pound level. Last year during this week, the price traded in a range between 82.31 and 84.45 cents per pound, so cotton is lagging the price action during the second week of April compared to 2018. However, the cotton market always has the potential for explosive or implosive moves. With the uncertainty of the ongoing trade negotiations which will have significant ramifications for the Chinese and global economies, and the fickle nature of weather as the 2019 crop year is starting with floods across vast areas of the US, anything is possible when it comes to the price of the cotton futures market over the coming weeks. The investment seeks return linked to the performance of the Bloomberg Cotton Subindex Total Return. The ETN offers exposure to futures contracts and not direct exposure to the physical commodities. The index is composed of one or more futures contracts on the relevant commodity (the index components) and is intended to reflect the returns that are potentially available through (1) an unleveraged investment in those contracts plus (2) the rate of interest that could be earned on cash collateral invested in specified Treasury Bills. The cotton futures market often suffers from periods of illiquidity which can lead to price gaps on the up and the downside. 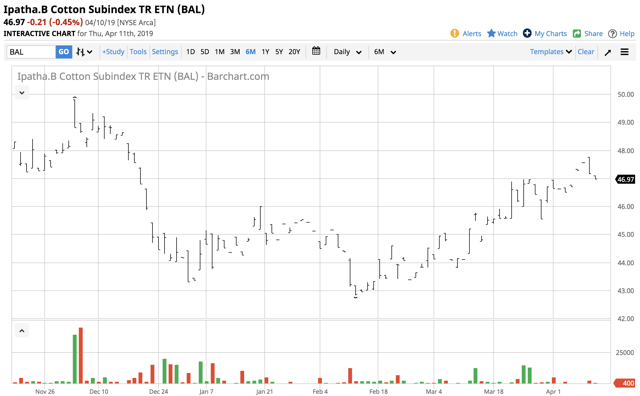 For that reason, the net assets of BAL are low at $8.94 million, and only an average of 2,254 shares of the ETN change hands each day. However, BAL does a reasonable job replicating the price action in the cotton futures market. Cotton rose from 69.53 cents in mid-February to its most recent peak at 79.31 cents on April 9, a rise of 14.1%. Over the same period, BAL rose from $42.82 to a high at $47.75 per share or 11.5%. 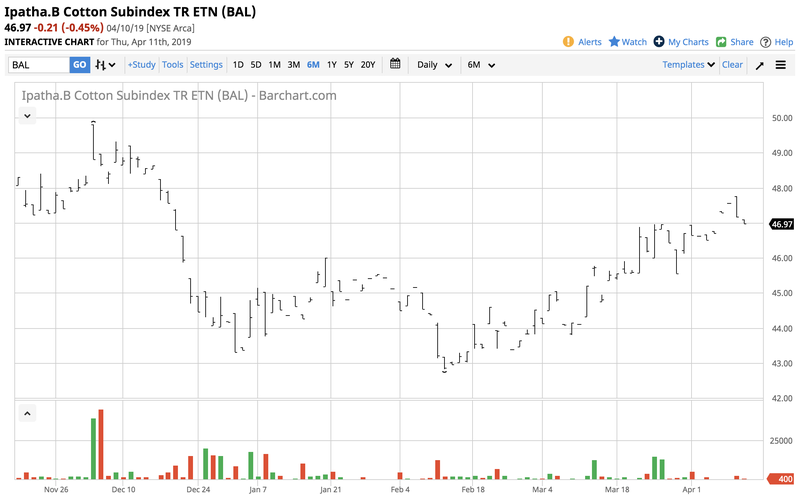 If the bullish stars line up in the cotton futures market, the BAL ETN will follow the fiber on the upside. The weather and trade issues are the critical factors that will determine the path of least resistance for the soft commodity over the coming weeks. Meanwhile, we are at a time of the year when cotton tends to exhibit price strength as uncertainty often causes concerns about supplies to increase. The Hecht Commodity Report is one of the most comprehensive commodities reports available today from the #2 ranked author in both commodities and precious metals. My weekly report covers the market movements of 20 different commodities and provides bullish, bearish and neutral calls, directional trading recommendations, and actionable ideas for traders. I just reworked the report to make it very actionable! The author has long positions in cotton with tight stops.